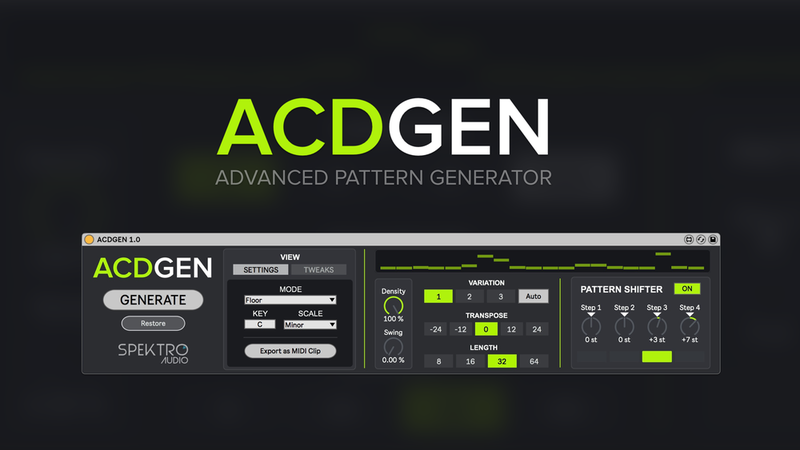 Introducing ACDGEN – Hardware Edition! Today we’re introducing our first ever hardware product: ACDGEN – Hardware Edition! While our focus continues to be in software-related projects, there has always been an interest in making a physical product that would match our design principles. The hardware edition will enter the ACDGEN product line alongside the Max for Live version, which will continue to be updated in the future. As always, we’ve prepared a video to showcase all the features available in ACDGEN – Hardware edition, check it out! 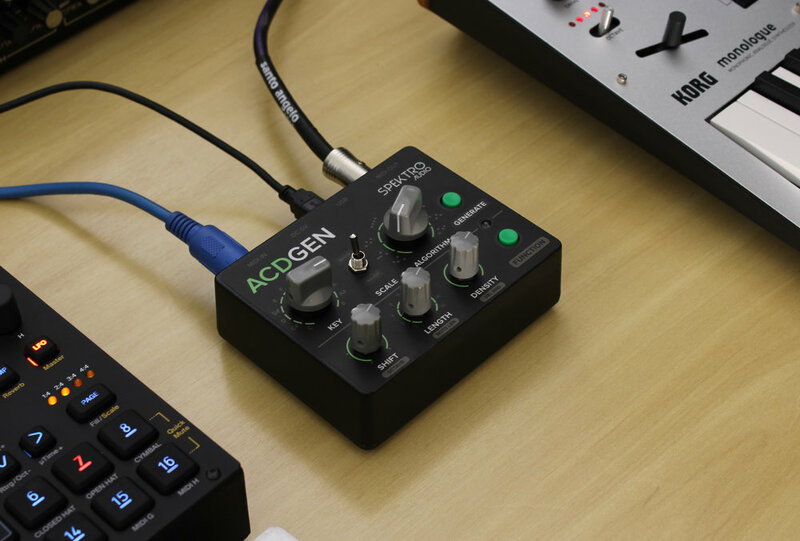 ACDGEN – Hardware Edition is a standalone desktop unit that can generate MIDI patterns that can used to create basslines and melodies. We designed it to be fun and easy to use on stage and in studio. It syncs via MIDI Clock, features USB and MIDI ports and, while it works very similarly to the Max for Live version that we first released back in August 2018, it also includes some brand new features. We’ve also included a free software customizer which let’s you change certain settings of the hardware. These settings can be stored directly into the unit’s memory and loaded up automatically when the unit gets powered on. If you’d like to check out all the features included in ACDGEN – Hardware Edition, check out the user manual. All the hardware units are handcrafted in Brazil by Ícaro Ferre and Vinicius Brazil, the creator of the Vinicius Electrik Eurorack modules. Because manufacturing products like these in Brazil is both expansive and difficult due to logistics and limited access to certain parts, we’re only making 20 units for the first run. If you’d like to purchase a unit, get in touch with us via the Contact form. 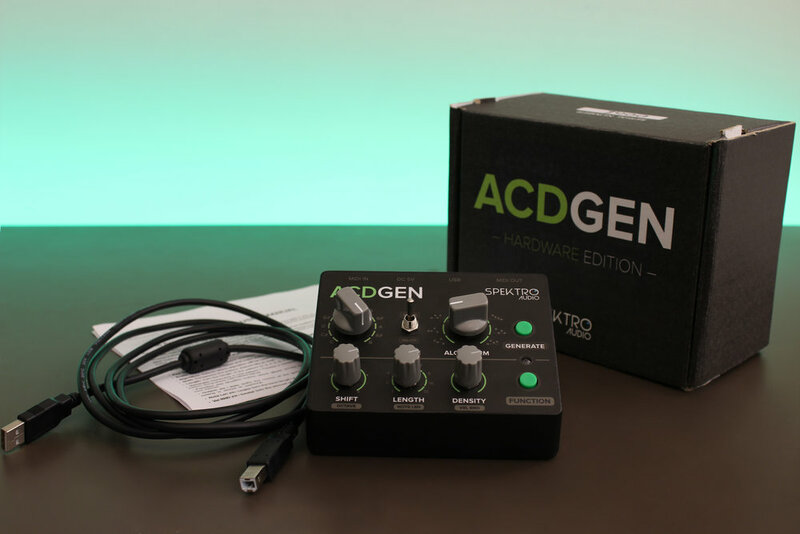 For more information about ACDGEN – Hardware Edition, visit http://spektroaudio.com/acdgen-hardware-edition. Hello everybody! This is Icaro Ferre and today I'd like to share something I've been working on called Patchbook. To put it simply, Patchbook is an open-source markup language / standard designed to be easily readable and writeable by humans that can be used to write down modular synth patches. My goal for Patchbook is to create a standard that can help users write down patches in a way that could also be potentially used by different websites, educational tools, applications and services. The official parser (a simple python program) can process .txt files written in the PatchBook format and output a JSON file that could be used by other applications to display and process the patch's data (a diagram of the data structure is available on the GitHub page). Programmers should have no problem using the JSON files generated by the parser to create all kinds of different patch visualizations, processing, etc. Example of a signal Flow chart generated using the Patchbook parser and the GraphViz Online Editor. The parser also includes additional functions like the ability to automatically create signal flow charts (using GraphViz), to display all the information related to a single module in the patch and also to display all connections organized by type (gate, pitch, audio, etc). While I hope others can also create programs to use the Patchbook standard for different application, I also plan on adding more built-in functions to the official parser. While the initial release of Patchbook should work great with simple patches, there might be issues when using it with larger and more complex patches that I might have not considered yet so I highly recommend keeping up with the project on GitHub. I hope Patchbook can be used to help the modular synth community grow and become even more knowledgeable. As always, feel free to get in touch with me via Twitter (@SpektroAudio or @icaroferre), email (via Contact page), Facebook, Email, Muffwiggler PM, GitHub, etc. Today we're releasing the new Mod7 pack for CV Toolkit and the 2.6.1 update which includes bug fixes and improves support for the new modules. The new Mod7 module pack for CV Toolkit is now available and it includes 7 amazing new modules: AutoSlide, Drunk Modulator, Function Generator, Game Controller, Infinite Sequencer, Loop Extractor, and Variable Clock! The Mod7 pack contains some of the most advanced modules we've developed for CV Toolkit to date and we believe it'll be a great addition to the CV Toolkit platform. For a detailed description of each of the modules contained in the pack, please check the Mod7 section on the CV Toolkit User Manual. 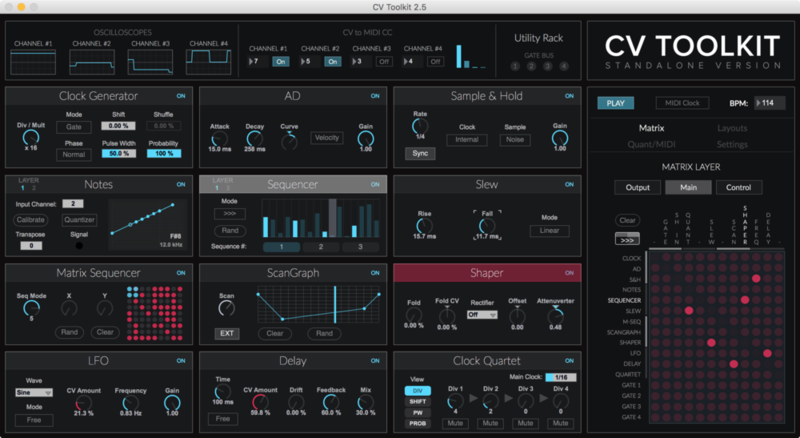 Mod7 is available for U$9.99 on the CV Toolkit product page. We've also included Mod7 in the new CV Toolkit – Complete Bundle 2. The bundle now includes all packs available to date (Deluxe, Beats, VBrazil and Mod7) and it's available for U$49.99. If you've already purchased the Complete Bundle 1, then you can purchase the new Mod7 separately. Notice that we've also raised the price of the bundle to accommodate for the new pack in order to treat both our new and existing customers equally. Please notice that the Mod7 pack requires CV Toolkit 2.6 or higher. If you're using an earlier version, you'll need to update CV Toolkit to properly run the new modules. If you need help updating, please get in touch with us via our Contact page. Today we're also releasing the 2.6.1 update for CV Toolkit to fix some bugs that were found during the Mod7 development. While these bugs are not critical, we highly recommend updating to ensure full compatibility with the new modules. If you'd to know more about our future projects, follow us on Facebook, Twitter (@SpektroAudio) and Instagram (@SpektroAudio). The new CV Toolkit 2.6 update is now available and it includes many new features and improvements to the CV Toolkit software. Our main goal for this update was to improve CV Toolkit's sync features and many of the components that make up the virtual modules' framework. This new update also includes many small improvements to the virtual modules in order to improve the software's workflow, flexibility and usability. We're excited to announce that the 2.6 update adds support for the new Ableton Link technology. Ableton Link lets you easily syncronize CV Toolkit to a number of different applications such as Ableton Link, Propellerheads Reason, Serato DJ, iMaschine 2, Korg Gadget, iMPC Pro and many others. To enable Link, go to the Sync / Misc tab on CV Toolkit's side-bar and select Link as your sync method. While MIDI Clock sync has always been an available as a sync method ever since CV Toolkit 1, we re-designed how it works behind the scenes in this new version to make it better and more reliable than ever. To make both of these sync methods more accurate and reliable, we added a Sync / Delay compensation feature and changed how the modules generate their own internal clocks and sync to clocks generated by other modules. The new 2.6 update also adds two new virtual modules to the Factory pack: ADSR & Input. ADSR is a 4-stage linear envelope generator. It's a simple yet very useful module. The new Input module lets you bring external CV signals into CV Toolkit via an Expert Sleepers ES-6, ES-7 or ES-8 module. It includes a built-in attenuverter, offset generator, slew generator and bipolar half-wave rectifier to help you shape incoming signals. You can also use the Input module to bring external clock signals into CV Toolkit and distribute them to the virtual modules via the Gate Bus. • The framework we built for the virtual modules was re-designed to be more efficient and to include new features that will be used by new virtual modules released in the future. • Keyboard Representation for the Global Quantizer so you can now quickly visualize which notes are turned on or off. • Virtual modules such as the Sequencer and Sample & Hold can now output their internal clocks to the Gate Bus. • The Sequencer module now includes an Auto-Slide feature. When enabled, Auto Slide will adjust the sliding time between the steps according to the their value difference. You can also set the maximum slide time from 5 to 150 ms.
• The Snap feature in the ScanGraph module is now available as a button on the module's panel. 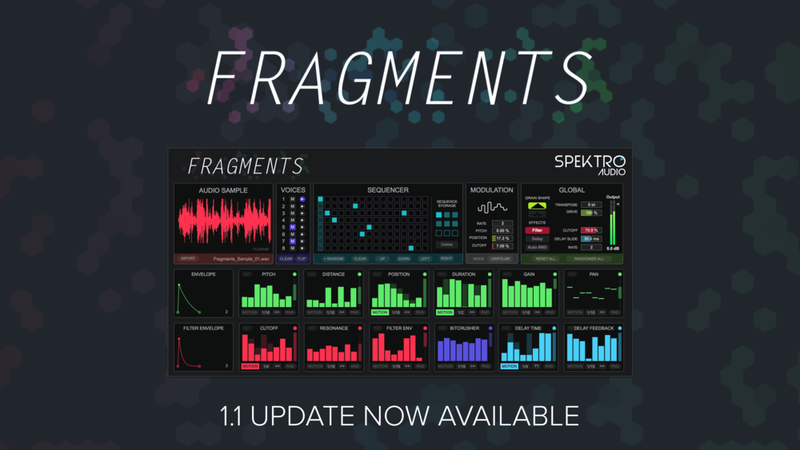 • Adjusted the length of the triggers generated by the Clock Generator, Reset, and Euclidean Sequencer (Deluxe Pack) modules (now 20ms). For a complete change-log of this new version, check out the Change-Log section in the User Manual. We've worked hard to make the new CV Toolkit 2.6 update as good as possible and we hope you enjoy it as much as we do. A new module pack is also in the works and will be released soon! Make sure to follow us on Facebook, Twitter (@SpektroAudio) and Instagram (@SpektroAudio) for previews and other announcements! 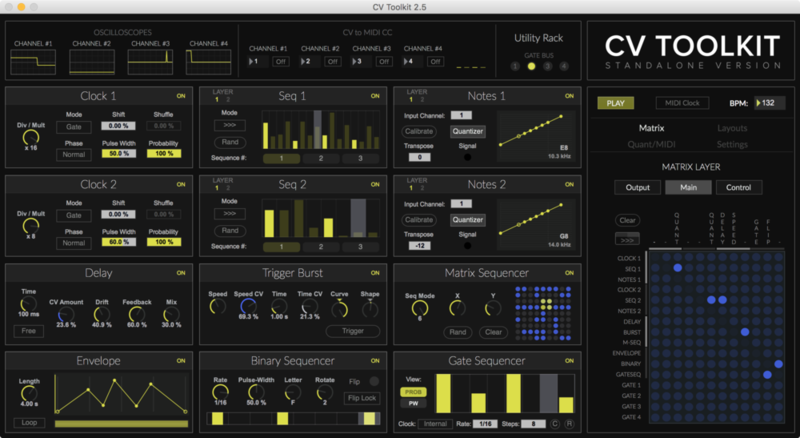 We're excited to announce that CV Toolkit 2.5 is now available and it includes major new features and enhancements. Ever since we first released CV Toolkit 2, we've been receiving many user requests for major features and, for this update, we decided to fulfil many of these requests. Layouts are now more powerful and useful because they now remember all the settings for each of the modules, multiple VCO calibrations, custom titles, routings made via the Routing Matrix, internal CV buses assingments, as well as the setting for the global quantizer and voice mode. You can now use Layouts to store the entire patch of a song, ideas for live-performance patches, and when you re-load any of these stored layouts, CV Toolkit will restore to the exact same state as it was when the layout was saved. After loading an existing layout, you can also click on the squares that represent the 12 slots (inside the Layouts Preview container) to reset the parameters of the corresponding slot back to the stored values. This is a great feature for resetting certain modules back to their stored settings after jamming for while. CV Toolkit now includes a variety of different themes that let users customize the interface to better suit their taste and needs. The new themes are: Tech, Forest, Red Velvet, Grayscale, NightLife, Anachrome and High Contrast. While some of these themes were added for aesthetic reasons, NightLife, Anachrome and HighContrast were designed to work as accessibility features as well. NightLife and Anachrome were both designed to use colors that are not affected by different kinds of colorblindness (Deuteranopia and Tritanopia respectively). High Contrast was designed to help users that struggle with low contrasts. Our goal is to continue to add new themes in future updates. The new OSC implementation in CV Toolkit 2.5 is much more advanced than the first version available in CV Toolkit v1. 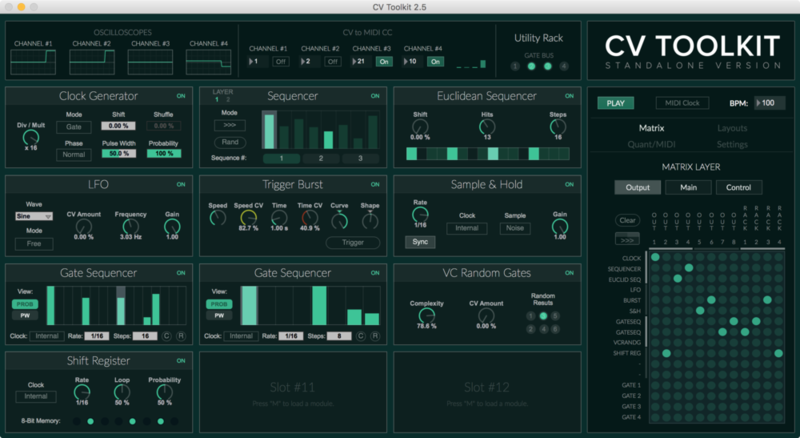 It's now easy to create and map custom OSC templates to now control any of the 12 slots. If you'd like to control, for example, the Frequency of a LFO module loaded in Slot #4, all you need to do is to add a knob / dial to your OSC template editor (using any OSC application such as Lemur or TouchOSC) and set it to send OSC to the address: /4/Frequency. 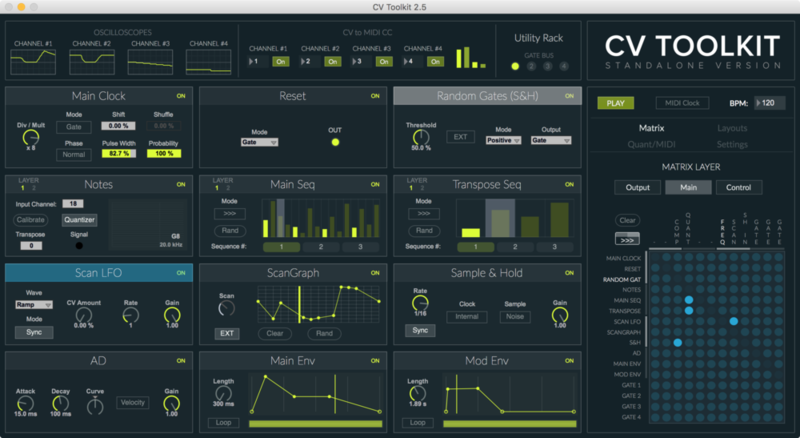 The new OSC implementation also lets you control global parameters such as BPM, MIDI Clock sync and transport control. 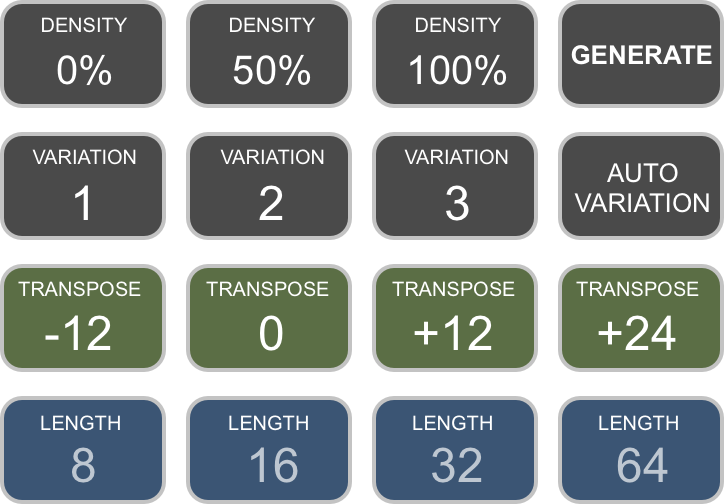 We highly recommend creating Layouts that match your OSC templates. This way you can always make sure that the modules are loaded in the correct slots according to your OSC mapping (and vice-versa). Some users pointed out how complicated it could be to keep track of the purpose of each of the virtual modules when used in more complicated patches (specially when using multiples of the same module). You could, for example, rename the Notes module according to the name of the VCO it's calibrated. To check out all the changes included in this new version, check out CV Toolkit's change-log available in the User Manual. The new CV Toolkit 2.5 update is free for all existing customers. 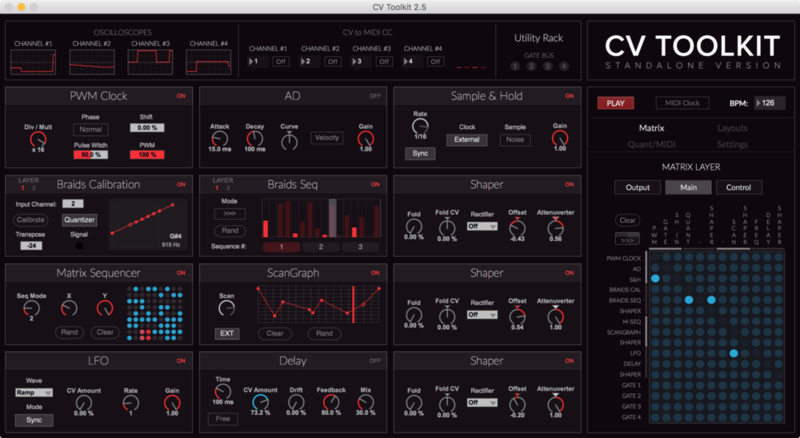 CV Toolkit is available for U$19.99 at http://spektroaudio.com/cv-toolkit-standalone. To keep up with what we're currently working on, make sure to follow us on Instagram and Twitter. The new 2.2 update for CV Toolkit is now available and it includes many new (and most-requested) features, enhancements and bug fixes. The Notes module can now save and restore calibration files. When an existing calibration file is loaded, the Notes module will automatically validate it and display the results via the new Smart Tuner. For more information about this feature, check out the User Manual. The Notes module now remembers the Input Channel. Custom scales can now be saved and deleted from the Quantizer / MIDI Settings tab. Re-designed CV to MIDI CC Converters to add individual On / Off toggles and initial burst (for MIDI mapping). The Voice Mode setting is now stored within Layouts. New toggle button for the routing matrix visual-feedback mode. The MIDI Pitch Bend range can now be adjusted from the Quantizer / MIDI Settings tab. Added triple divisions and multiplications to the Clock Generator and PWM Clock modules. Added ratio mode to the Morphing VCO module. Added “Velocity” toggle button to AD Envelope. Fixed a bug that would cause the Gate Sequencer module to drift out of time when using triplet clocks. The GateBus Display leds on the Utility Rack are now numbered. Don't forget to check out the updated User Manual for more information about these new features and enhancements. We've been working hard to continue to make CV Toolkit better with each new update. If you'd like to suggest new enhancements, features or even ideas for future module packs, get in touch with us via our Contact form! CV Toolkit 2.2 is a free update for all existing CV Toolkit customers. For more information about CV Toolkit 2, including some great video tutorials, visit http://spektroaudio.com/cv-toolkit-standalone. 2016 is here and we already have some great news to share with you, including a new CV Toolkit update and a new video tutorial! The new 2.1.1 update for CV Toolkit is now available and includes a brand new app icon, new Retina graphics, and many bug fixes. We're already working on the next 2.2 update which will include many user-requested features. If you've already purchased a copy of CV Toolkit, check your email inbox for a new download link. A new CV Toolkit video tutorial is now available! Watch it and learn how you can combine multiple CV Toolkit modules using the internal Gate bus to create a clocked and quantized sequence. I (Ícaro Ferre) was recently interviewed by Darwin Grosse on his "Art + Music + Technology" podcast. During the interview, I talked to Darwin about modular synthesizers, CV Toolkit, Max for Live, and my background in music and technology. If you'd like to keep up with our latest news and check out what we've currently working on, don't forget to follow us on Twitter and on Instagram.